I'm gonna keep this as short as possible to let you at least know how every operators work. Don't expect any in-depth stuff from this at all. This is aimed for beginners that's still learning the basics of the game. He can blowtorch through reinforced walls to make small holes to peek and shoot through. Try to catch him offguard while he's burning a hole with his torch. When you see a timer on the top of your screen counting down quickly find a safe spot to hide. Once the timer goes off, don't move unless you're getting shot at or you're sure they've found you. If you move while his ability is active, you position will be revealed. Her boost's area of effect is global. Her boost gives her teammates 25 shield, Movement speed and Recoil Reduction. If her teammates are injured, her boost revives the injured teammate. She can make phone calls to everyone on the defender's team to give out their location. She can have access to the defender's cameras after interacting with a dead defender operator. Her phone call doesn't work on Echo. She can fire concussion grenades that temporaily deafen the defenders, also causing them to be half-blind and experience dizzying effects. She can fire grenades similar to impact grenades to open holes through breachable surfaces. She can recover really quickly from concussion effects. She can throw a flashbang, except that it flashes several times in a row. She can also stick her flashbang on breachable surfaces. Flashing enemies on the other side. She won't get blinded by her own flashbang. He can trace defender's footprints. Mute jammers disables his ability to track footprints. Hibana can break through reinforced walls with her pellets. Her pellets opens a small rectangular hole but she can fire several of them to make a larger hole. Bandit's shock wire or Mute jammers can disable and destroy the pellets. Fires a bolt that deals damage to defenders in area of effect. He can also fire a smoke grenade. He can't make a headshot with his crossbow. He can place a bulletproof shield on top of his weapon. When he's aiming with his sight's, the shield will protect his head from headshots. Blackbeard + Crouch + Highground = Profit. His shotgun can shoot through non-reinforced walls, floors and ceilings. With that being said, don't stay near breachable surfaces. His hammer can be used to break through breachable walls and floors. His hammer can also be used to destroy deployables. He's vulnerable while using his hammer, since it takes so long for him to take and swing it. He can throw an EMP grenade to disable any electronic devices in range. 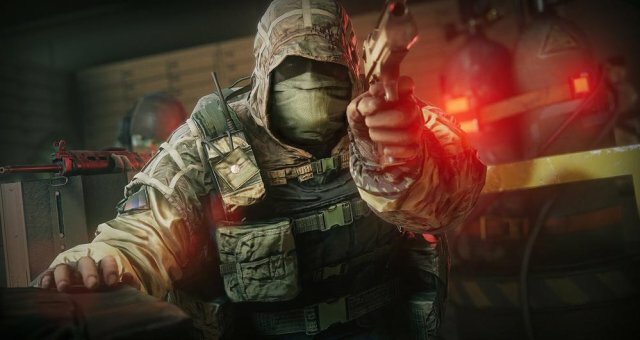 This includes Cameras, Sights, Pulse's heartbeat sensor, and even Vigil's ability. She can use breaching rounds to break through breachable surfaces. Breaching rounds can be used to destroy deployable shields or barbed wires. Bandit's shock wire and Jager's ADS can destroy her breaching rounds. His exothermic charge can break through reinforced walls, very loudly. He's vulnerable while placing an exothermic charge. Bandit's shock wire and Mute jammers can disable and destroy his exothermic charge. Grenades and Well placed Nitro cells can ruin his day. He won't get knocked back by melee attacks effectively if he extends his shield. Her drones can deal damage to enemies, deployables and cameras. Mute's gonna leave the game. His flash shield can be used to temporaily blind defenders. Unlike any other shields, he can sprint with his shield up. Mute jammers can disable his flash shield's active if he's in the area of effect. She can scan for electronic devices. This includes Bomb and Biohazard Containers. (Objectives in Bomb and Secure Area). She can't detect gadgets that don't run on power. Such as Frost's welcome mats. He can place Cluster Charges on breachable surfaces, popping grenades to the other side. It can injure and kill defenders on the other side, also destroying deployables. His scope comes with thermal sights, allowing him to see enemies more clearly. His scope can see through smokes. Her shield is extendable, like Montagne's. But unlike Montagne, she can be knocked back slightly with melee attacks. She can't shoot while she's holding her shield, but her shield can slow and deal damage. His cameras can be used to shoot targets. His cameras can't be destroyed by gunfire or melee hits. But can be destroyed by Sledge hammer. She can place clones of herself. Shooting the clone will reveal the attacker. The same goes if attackers tried walking through the clone. Vigil can use his ability to be invisible from cameras and drones. However, his footsteps can still be heard. Interference border will appear around the edge of the camera screen if Vigil is invisible but nearby. She can throw concussion mines that works like Zofia's concussion grenades. Her mines are quite small, so they aren't easy to find. Ela herself can also recover from concussion effects really quickly. He can place poison darts on floors, that's so small it's almost invisible. Poison darts deal damage per second and causes the attack to lose the ability to run. The effect ends after the attacker pull out the dart from his leg. She can place one-sided-mirrors that are also bulletproof. Banned in almost every game in competitive play. (Tournaments). Be careful if she placed her mirror beside a breachable wall, she will shoot you through it. His drone can hover and stick on ceilings. His drones can temporaily cause dizzying effects to enemies in range. While her ability is active, her footsteps are really quiet. She can injure her target then interact with him/her to execute him/her. After executing her target, all the attacking operators and position will be revealed. 1440p HD cameras running with constant 300 FPS and 0.1 m/s ping. She can break a barricade and throw her camera outside the objective building for spawnpeek. Her welcome mat can immediately injure an attacker that stepped on it. But her welcome mat is really huge and easy to notice. She will most likely place them behind deployable shields and below barbed wires to hide it. His jammers can disable any electronic devices in range. Because of how loud his jammers are to drones, Mute's existance can be revealed by attackers before the match even starts. Try destroying the jammer that's disabling your device, but make sure nones around to kill you. He can deploy poisonous smoke that deals damage in the affected area. Including his own teammates, but not himself. He can place reinforced barricades instead of wooden barricades. Reinforced barricades take 12 melee hits to break instead of 3. A hole around the size of bullet hole is made after hitting reinforced barricades with melee hits. He can scan for heartbeats through walls, ceilings and floors. In short, he's map hacking. His own heartbeat also goes down to 0 if he fails miserably. His stim pistol can heal allies or himself. If a teammate is injured, he can use it to revive him from a distance. He can also revive himself with the stim pistol. Place an armor pack for the whole team. Teammates with armor will take reduced damage from bodyshots. Attackers can steal your armor pack, so make sure it's empty or just destroy it if neccessary. His ADS can disable all grenades thrown into the device's line of sight. EMP grenades will still disable ADS if it's thrown in range and at ADS's blind spot. Place shock wires on reinforced walls or barbed wires. Anyone interacting with the shocked walls or wires will be damaged. Shock wires also destroys devices, Including your teammates devices. Deploys mounted LMG that melts anyone walking into line of sight. His LMG also has a bulletproof glass blocking headshots. Attackers will kneel down and pray everytime they see him. His traps deal damage to attackers that walked past. Peeking sideways of a door is a great way to check for his traps. Because a real hunter always watches where he steps.